‘War Horse: The Story in Concert’ The acclaimed story of humanity and enduring friendship from the perspective of one extraordinary horse. The acclaimed story of humanity and enduring friendship from the perspective of one extraordinary horse. 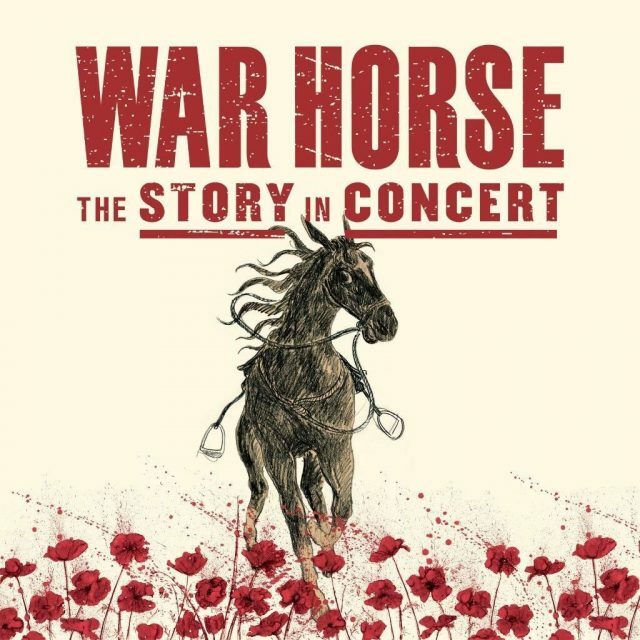 BMG is thrilled to announce the release of ˜War Horse: The Story in Concert’ narrated by Michael Morpurgo and Joanna Lumley.The music, composed by Adrian Sutton with songs by John Tams, is performed by the critically acclaimed Royal Philharmonic Orchestra, Tim van Eyken (the original Songman from the National Theatre’s ‘War Horse’ and London Voices, conducted by David Angus. The Collector’s Edition offers the consumer a 360 experience. It will arrive in a custom-made military styled canvas bag Open it to find a 12″ case bound 76-page book with the full script of the narrated story and original illustrations by Olivier, Tony and OBIE award-winning British designer Rae Smith; two audio CDs containing the complete orchestral recording with narration, one audio CD of the music only, two Vinyls of the music only, and a DVD featuring the making of the recording; a bespoke leather folio with two exclusive art cards and a set of four art postcards by Rae Smith, a certificate of authenticity signed by Michael Morpurgo, a page from the music score hand notated by the composer, a sketch book and pencil, and a replica WW1 Identity Tag. This is a limited-edition item with only 1000 in production. The novel, originally published in 1982, tells the story of a boy called Albert and his horse Joey, separated after the outbreak of World War One. Young Albert’s beloved horse Joey is sold to the cavalry and shipped to France where he witnesses the brutality of war from both sides. Even in the desolation of the trenches, Joey’s courage touches all those around him. Michael Morpurgo has written more than 100 books for children and won the Whitbread Award, the Smarties Award, the Circle of Gold Award and the Children’s Book Award. For the album ˜War Horse: The Story in Concert’, he joins Joanna Lumley, the award-winning actress, author and activist, to narrate the story that has captured the hearts of millions of people in the UK and around the world who have seen the National Theatre production, or seen the Spielberg film or read the original novel. War Horse is the powerful story of deep friendship surviving in terrible times – the tragedy of war and the beauty of peace. ‘War Horse: The Story in Concert’ will be released in 5 different formats. Case bound book featured the full script of the narrated story. 2 exclusive Rae Smith art cards. 3 Audio CD’s featuring full narrated script and music only audio. Michael Morpurgo began writing stories in the early ’70’s, in response to the children in his class at the primary school where he taught in Kent. One of the UK’s best-loved authors and storytellers, Michael was appointed Children’s Laureate in 2003, a post he helped to set up with Ted Hughes in 1999, and was awarded an OBE in 2007. He has written more than 130 books, including The Butterfly Lion, Kensuke’s Kingdom, Why the Whales Came, The Mozart Question, Shadow, and War Horse, which was adapted for a hugely successful stage production by the National Theatre and then, in 2011, for a film directed by Steven Spielberg. His book, Private Peaceful has been adapted for the stage by Simon Reade and has now been made into a film, directed by Pat O’Connor. He has won numerous awards including those voted for by children themselves, the Blue Peter Book Award and the Children’s Book Award. His latest book published in Autumn 2017 is Toto: The Dog-Gone Amazing Story of the Wizard of Oz, a retelling of the famous story through the eyes of Toto, the dog. Michael’s books have been translated into many languages and he travels all over the UK and abroad talking to people of all ages at literary festivals, telling his stories and encouraging them to tell theirs. With his wife Clare, he set up the charity Farms for City Children, which offers children and teachers from inner-city primary schools the chance to live and work in the countryside for a week. HRH The Princess Royal is Patron of the charity. The couple were awarded MBE’s for their work in education. Born in India to English parents, Joanna Lumley, OBE, was raised in Kent before she embarked upon a phenomenally successful multi-faceted career. One of the nation’s most beloved entertainers, Lumley is arguably best known for a long and diverse acting career for which she’s earned recognition in the shape of a BAFTA Fellowship and a Special Recognition Award at the National Television Awards. After first coming to attention as a model, Lumley’s acting career started to take shape with some early film and television roles including Coronation Street before she found wider fame in The New Avengers. Lumley proved to be a natural fit for her character Purdey, a British spy whose femininity masked her abilities as a martial arts expert and as a markswoman. She followed The New Avengers with a variety of roles that escaped typecasting including two Pink Panther films and the cult sci-fi series Sapphire & Steel. Lumley’s career enjoyed a huge resurgence from the early Nineties with her role as the hard-living, narcissistic fashion director Patsy Stone in the comedy Absolutely Fabulous. A defining hit of the era, Absolutely Fabulous extended to five series, a run of twentieth anniversary specials and a hit 2016 film. In 1994, Lumley embarked upon a nine-day adventure in which she effectively lived alone on a desert island near Madagascar. The result was the BBC documentary Girl Friday and an accompanying book, and it paved the way for future travel documentaries which have taken her as far afield as Norway, Egypt, Japan and India. Her acting career nonetheless continued to extend with a blend of major roles, cameos and voiceover work. Highlights have included Martin Scorsese’s The Wolf Of Wall Street and Tim Burton’s Corpse Bride. In addition to film and television work, Lumley has also acted in theatre and written several memoirs. Most recently, Lumley has become renowned for her committed and high profile support for a variety of causes and charities. These have included her campaigning as the public face of the successful Gurkha Justice Campaign, and she has also been a long-term supporter of the human rights organisation Survival International. Adrian’s scores cross orchestral, chamber and electronic genres, and have featured in a number of successful theatre productions, including Angels in America (National Theatre Lyttelton and NT Live) and the six-times Tony-nominated The Curious Incident of the Dog in the Night-Time (National Theatre Cottesloe, Gielgud Theatre West End, Barrymore Theatre Broadway, and two UK tours). In 2013 he received a joint Olivier Award for Curious Incident‘s Sound Design, and also produced and released Curious Incidentals, the soundtrack album from the play. Further successes include Coram Boy and War Horse at the National Theatre for which he also received Olivier nominations; Coram Boy opened on Broadway in 2007. War Horse transferred to the West End in 2009 and opened on Broadway in 2011 before opening in multiple productions worldwide including Canada, the USA, Australia, Berlin, the Netherlands and China. His War Horse Suite, a 25-minute symphonic orchestral work derived from the score for the show, was premiered by the Royal Philharmonic Orchestra (RPO) in June 2010 and, along with a new commission Some See Us from the BBC Proms, featured as the centrepiece of a ‘War Horse Prom’ in the 2014 Proms season at the Royal Albert Hall. His score for War Horse: The Story in Concert was premiered in October 2016 at the Royal Albert Hall, featuring Michael Morpurgo and Joanna Lumley reading the book on-stage, accompanied by the RPO and singers. His children’s concert opera The Griffin and the Grail was premiered by the RPO, choirs, soloist and narrator Olivia Colman at Cadogan Hall in December 2013. Other work for theatre includes Husbands & Sons, Rules for Living, Nation and The Revenger’s Tragedy at the National. His work for TV and film includes Chris Morris Jam, Blue Jam and the BAFTA-winning short film My Wrongs. Orchestral works include A Fist Full of Fives, performed on BBC Radio 3 by the BBC Symphony Orchestra, and a Sinfonietta. In 2013 the violinist Fenella Humphreys commissioned Adrian for Arpeggiare Variations, one of six new works as part of her Bach2TheFuture series for unaccompanied violin by British composers, released on the Champs Hill label. David’s professional career began as a repetiteur with Opera North (UK), before becoming Chorus Master and Staff Conductor for Glyndebourne Festival Opera. He has worked with Scottish Opera, Opera North and English Touring Opera, and conducted many productions elsewhere in the UK and Ireland, including several British premieres for the Brighton Festival.Â He has also conducted at the Canadian Opera Company, Cleveland Opera, Opera National de Paris, Danish National Opera, Malm Opera and Icelandic Opera. On the UK concert platform David Angus regularly conducts the London Philharmonic, both in concert and in the recording studio, and has given many concerts with the London Mozart Players. He has conducted most of the major orchestras in the UK, including the Hall Orchestra, the BBC’s Philharmonic and Scottish Symphony Orchestras, the Ulster Orchestra, English Chamber Orchestra, the Scottish Chamber Orchestra and the Northern Sinfonia. Tim made his first album, New Boots, in 1998, and in the same year won the BBC Young Folk Award. Following extensive solo touring, including work for the British Council in the Middle East, Oman, Mozambique and Macedonia, he joined Waterson: Carthy with whom he toured and recorded for six years. He was a founder member of the band Dr Faustus. In 2006 he released his album â€˜Stiffs Lovers Holymen Thieves, and he and his band Van Eyken were nominated for four BBC Radio 2 Folk Awards in 2007 and went on to win the award for Best Traditional Track with ‘Barleycorn’.